Give the most luxurious food gift available, a Meal of the Month Club from Send a Meal. Your gift recipient will receive a beautiful specially prepared certificate and a list of every meal they can look forward to receiving. Each month's meals serve four people, and most meals can be easily split to serve two to last throughout the entire month. Simply place the remaining easy to use packaging in your freezer and heat the remaining portions when your ready to eat them! 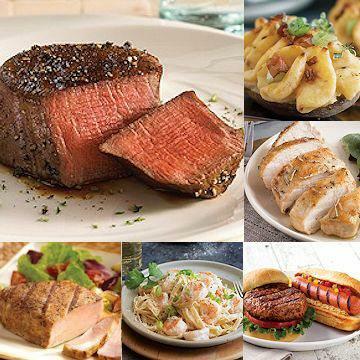 Join the Meal of the Month Club and each month you'll receive a complete gourmet meal including. Each meal will be delivered during the 3rd to 4th week of each month according to length your meal plan. Order this monthly meal plan now to receive FREE SHIPPING every month! Give the perfect hassle free gift that keeps on giving! The Meal of the Month Club is the perfect gift for just about anyone! A truly gourmet experience! Each month our meals feature only gourmet items, made by hand with the freshest, all natural ingredients. We pride ourselves in selecting only the best-of-the-best and you'll taste the difference in every single bite. The monthly dessert is available as an add-on. * Dessert is available as an add-on option.